Recently seeing blog posts by Ren and the pics he took of himself on the edge of the rock formation, I commented on his post about my fear of heights. 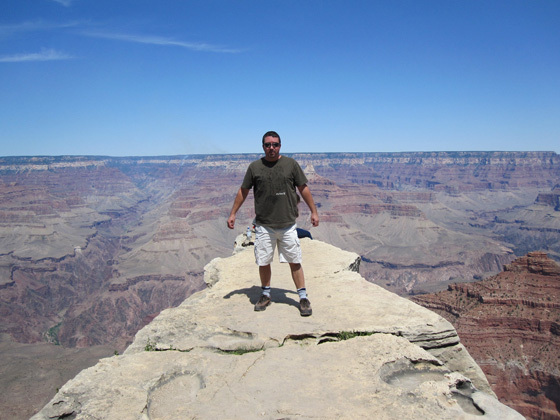 Then I remembered a pic I took of myself when my daughter and I went to the Grand Canyon in August 2009. I obviously got over my fear of heights for this capture. Nice. I don’t recall you mentioning this trip before, but I could have easily forgotten about it in the last seven (!) years. I updated this post with the link to the original blog post of this 2009 trip, which has more photos. Thanks. I did remember the Arches Nation Park pictures, but for some reason, the Grand Canyon visit slipped my mind. I don’t know if I could stand there. Yeah, I’m pretty sure I got the willies in that spot. But the beauty and scenery thankfully took over my fears to get that photo.